It’s June 2017 and in Sardinia, England have just lost a hard-fought World Championship final 3-0 to Ukraine. The international sporting media is, well… nowhere. Despite being one of the most successful of the 28 England squads in recent years, the Partially Sighted Squad are off the radar to even the most ardent of ‘England’ football fanatics. Their silver medal performance merited a mere 152-word report on the FA website. 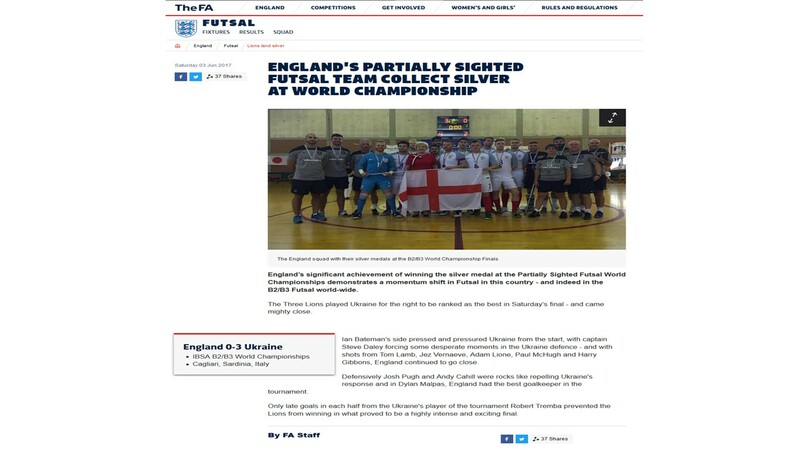 My research on the experiences of partially sighted footballers in England has revealed that a lack of recognition for their endeavours is just one of the many challenges within the sport. The international game involves players who are registered as partially sighted and classified as B2-B3, under IBSA classification rules. At grassroots, the Partially Sighted Football League (PSFL) welcomes players classified between B2-B5. Futsal, the small-sided game officially recognised by UEFA and FIFA, is played at both levels, replacing traditional 5-a-side in the PSFL about a decade ago. Rules and quotas are in place for international competition to ensure that the playing field is as level as possible. In the PSFL, in the name of inclusivity, there are currently no rules or quotas in place so, technically, a team of B2s could be playing against a team of B5s. In the PSFL goalkeepers are usually partially sighted, but only sighted goalkeepers can compete in international competitions. Aside from the usual ‘disability sport’ issues of a lack of funding, reliance on charitable organisations and volunteers, lack of opportunities and limited awareness of the game, my research has revealed a number of controversies and challenges experienced by players. Although some County FAs provide impairment-specific (as opposed to pan-disability) opportunities for partially sighted players, many do not. The PSFL, run by a dedicated team of volunteers, is therefore the main provision for impairment-specific football across the country. But there is currently only six PSFL teams (London Metro A, London Metro B, Birmingham, North West Scorpions A, Northwest Scorpions B, Cheshire) competing in one national league, and this number has dropped in recent years. Tournaments in the 2018-19 season are scheduled to take place in Birmingham, Leyton, Newcastle and Tranmere, but not all clubs have the use of minibuses, so players are reliant on costly public transport and taxis, or dependent on others to get to venues. This is particularly problematic considering research has revealed a range of difficulties faced by visually people in relation to travel. On the pitch itself, the combining of classes and the broad spectrum of visual impairment within each class, leaves players on the margins of two different classes vulnerable to exclusion. Whereas combining classes works to ensure viable competition on the one hand, it can also contravene notions of equity and inclusion for some players in the B2 class. The ‘fairness’ of classification is further challenged by the inclusion of a B5 class within the PSFL. The B5 class is described by British Blind Sport (BBS) as having “no top limit” and is therefore “banned in almost all visually impaired sports” (BBS, n.d.). Players have questioned the inclusion of the B5 class, making a clear distinction between ‘legitimate’ B5s, who have a degenerative condition and/or don’t hold a driving licence due to the severity of their visual impairment, and those who, despite being officially classified into the B5 class, have their visual impairment scrutinised because they hold a driving licence. In terms of the classification process, some players regard it as complex and confusing, incapable of accounting for diversity within each class, lacking sport-specificity and requiring greater transparency. All of this leads to a lack of faith in the system and a degree of speculation regarding the accuracy of other players’ designated class. This speculation fuels rumour and gossip which can culminate in accusations of intentional misrepresentation (IM) at both grassroots and international levels. So, whilst football opportunities exist for people with partial sight, and involvement can have a significant impact in players’ lives, relevant stakeholders have a number of challenges to negotiate in order to make the game more accessible, equitable and receive the recognition it deserves.